Livit Studios based in Irvine, California have created a new range of educational books which allow students to learn more about the human body using augmented reality. 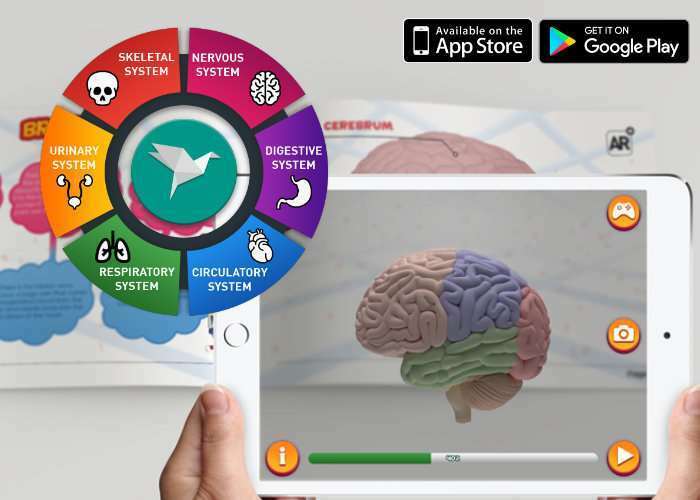 Designed to unleash your children’s inner scientist the augmented reality book and companion application which can be loaded onto both iOS and android smartphones and tablets reveals more about the human anatomy and bodily functions. Imagina Books is a series of Educational Augmented Reality books that blends between the classical book reading experience and the recent technology, Augmented Reality, that boosts visualization and Imagination leading to better understanding, more enjoyable and a better hands-on experience for our kids. The book and the mobile application are the two pillars of this experience. The Human Body, our first book, is a complete gamified journey inside the human body. Now, your children can explore all their body organs and functions with an interactive augmented reality experience. All what they have to do is point their tablets and mobile phones to the book and leave the rest for their imagination. When they point their phones at any page in the book, the body organ showed on the page will come to life as a 3D model on the screen of your phone or tablet. Jump over to the official Kickstarter campaign page by following the link below for more information and to make a pledge from just $21 for earlybird backers, with shipping expected to take place during March 2018 if the Kickstarter campaign is successful.